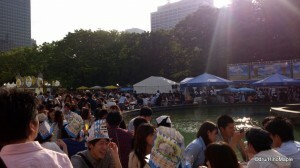 Every year, for the last while, a company has held an Oktoberfest festival in Hibiya Park. Hibiya Park was the first Oktoberfest festival from this company, as far as I can remember. The success of this festival has allowed this festival to go from a single festival that spanned a weekend in September to a series of festivals that run from spring to autumn and travels up and down Japan. For 2013, the first festival was in Odaiba in April, and this week, ending on Sunday, the spring edition in Hibiya Park will end. Each location has slight differences in the beers that are available but there is a large selection in each festival. 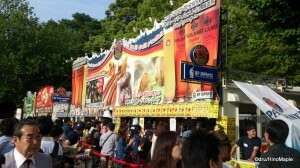 For the Hibiya Park edition, the park continues to see more and more brands enter the festival and this year they added a second Japanese beer to the mix. From the first time I went to the festival, they had Fujizakura beer, and recently they added Nest, from Mito. Needless to say, the festival is a huge success, financially, and it continues to bring in a lot of money for the organizers. The Hibiya Park Oktoberfest is centred on the main fountain in Hibiya Park and spills over into the surrounding park area. People bring their own plastic sheets to have a nice beer picnic or you can try to get a seat at one of the dozens of tables set up around the fountain. It is a good setup that has lots of problems as there are just too many people there. It is a very successful event but because it is so successful, it is difficult to get around as everyone is packed into the public areas. Everyone has the same idea as you, they are trying to find their friends, find a seat, buy beer, then bring beer back to their seats and so on. The Oktoberfest can be pretty expensive as the average price of a beer is over 1000 yen for 500ml. For a once a year party, I don’t mind going as the beer is usually good. Just be aware that the glasses cost 1000 yen each but you do get your money back when you return the glass. Do note that if you break your glass, you bought it, so you do have to be very careful when you walk around the crowded areas with a glass as it can be easy to drop it. As I said, the festival is a successful event. This is very obvious by the sheer number of people visiting the festival day in and day out. If you are visiting Japan, the best time to go is during the day on a weekday, and while it is a German beer festival, there are some great Japanese beers. I just chose not to drink the Japanese beers as I could get them any other time of the year. If you do go, just enjoy the park and hopefully the good weather as well. If you can’t make it this weekend, don’t worry as there are several other Oktoberfests around Japan. Within central Tokyo, the next Oktoberfest will be in Toyosu in July, then Shiba Park, near Tokyo Tower, in August. It then returns to Hibiya Park then Odaiba for September. If you can’t make it to Tokyo, you can still go to Nara, Nagasaki, Sendai as well as Tachikawa and Komazawa just outside Tokyo. Be sure to put your thoughts of money away and realize you aren’t paying for just the beer, but the atmosphere and the potential new friends you can make as well. 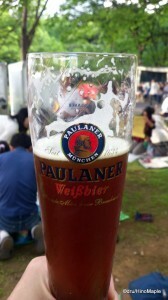 This entry was posted in Festivals, Tokyo Food and tagged beer, beer festival, festival, Hibiya, Hibiya Koen, Hibiya Park, japan, Odaiba, Oktoberfest, tokyo by Dru. Bookmark the permalink. An Oktoberfest in May, July, August and September. Oh, heck, why not! Oh, excellent idea for the consortium! Castle Lager is very good (a bit stronger and more bitter than Japanese beer), and Star Lager from Ghana and Tusker Beer from Kenya are also cool. Hooters was after Hibiya. And it was my first time. The consortium is good. I know someone who can brew some beer for us. I don’t know but I’m waiting…. ….